Fig.1 shows the transmitter of an ADM. The logic for step size control is added in the diagram. 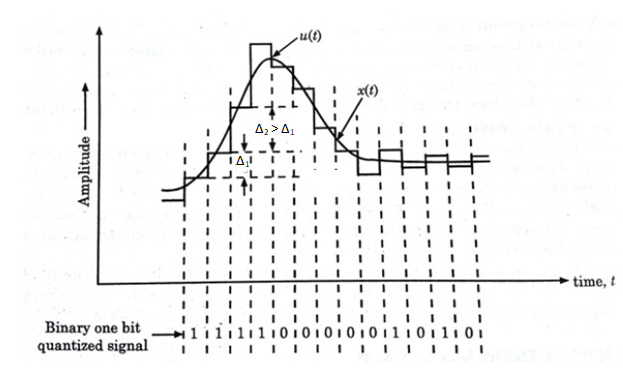 The step size increases or decreases according to a specified rule depending on one bit quantizer output. For an example, if one bit quantizer output is high (i.e., 1), then step size may be doubled for next sample. If one bit quantizer output is low, then step size may be reduced by one step. Fig.2 shows the staircase waveforms of adaptive delta modulator and sequence of bits to be transmitted. Fig.3 shows the receiver of an ADM. The receiver has two portions. The first portion produces the step size from each incoming bit.Exactly the same process is followed as that in transmitter. The previous input and present input decide the step size. It is then applied to the second portion i.e., an accumulator which builds up staircase waveform. The low pass filter then smoothens out the staircase waveform to reconstruct the original signal. The signal to noise ratio of ADM is better than that of DM because of the reduction in slope overload distortion and idle noise. Because of the variable step size , the dynamic range of ADM is wider than DM. Utilization of bandwidth is better in ADM than DM.